Did the Roman Emperors Use Josephus to Help Pacify the Jews? The Caesar’s Messiah myth proponents appear to involve Josephus in some sort of conspiracy to pacify the Jews. Their primary method, according to their view, is that Josephus was involved in the creation of the Christian religion as a kind of pacifist-messiah cult to replace their traditional supposedly militaristic messiah cult said to be found in their Scriptures. Why would Titus have done that if the Caesar’s Messiah theory of Atwill is correct and that history of the war apparently exposed the “truth” behind the gospels, that Jesus was a pacifist foil to Titus the conqueror? Yet persons with no first-hand knowledge, accepting baseless and inconsistent stories on hearsay, have written garbled accounts of it; while those of eyewitnesses have been falsified either to flatter the Romans or to vilify the Jews, eulogy or abuse being substituted for factual record. . . . Yet the writers I have in mind claim to be writing history, though beside getting all their facts wrong they seem to me to miss their target altogether. For they wish to establish the greatness of the Romans while all the time disparaging and deriding the actions of the Jews. But I do not see how men can prove themselves great by overcoming feeble opponents! Again they are not impressed by the length of the war, the vastness of the Roman forces which endured such hardships, and the genius of their commanders, whose strenuous endeavours before Jerusalem will bring them little glory if the difficulties they overcame are belittled. However it is not my intention to counter the champions of the Romans by exaggerating the heroism of my own countrymen: I will state the facts accurately and impartially. Josephus is telling readers what they would have expected to hear about other historians of the time, that they wrote flattering propaganda extolling the power and all-round superiority of the Romans while deriding the weakness and ineptness of their enemies, the Jews. Josephus, on the other hand, did point out certain failings of the Roman soldiers and the courage of his own countrymen. His own Judaeans, he writes, gave the Romans their money’s worth in order to win their victory. The question must be asked, then, why did Titus, according to Josephus, prefer his work rather than one of the many other historians of the day? Why would Titus have ordered more widely disseminated a work that did not ostensibly flatter the Romans or denigrate the Jews? Why, then, might Titus have promoted Josephus’ work? Second, the obvious independence of Josephus’ War could have been useful. After all, Christians would exploit Josephus’ work precisely because it was so clearly Judaean that it could not be suspected of bias toward them (Chapter 1). Third, after the war it was in the rulers’ interest to rehabilitate Judaeans, the dominant and traditionally stabilizing ethnos of southern Syria (Chapter 4). Would not such a mature political analysis by one of the region’s prominent aristocrats, written from realist premises, help everyone to settle down? Titus’ endorsement and broader dissemination of Josephus’ War could help to tamp down lingering hostilities and unproductive reprisals as in Alexandria and Antioch (cf. Ant. 12.122-24). That to me sounds more likely than the Caesar’s Messiah hypothesis. Josephus was as prepared to point out failings of the Roman armies at times as well as the courage of his own people against them. That’s not what we read in Josephus or in any other historian of the Flavians. Suetonius did write of the last of the Flavians, Domitian, who had one historian and his slaves executed, but that was because of some personal offence and did not represent a wholesale rounding up of historians and destruction of all their works. All the other histories flattered the Romans. Mason, Steve. 2016. 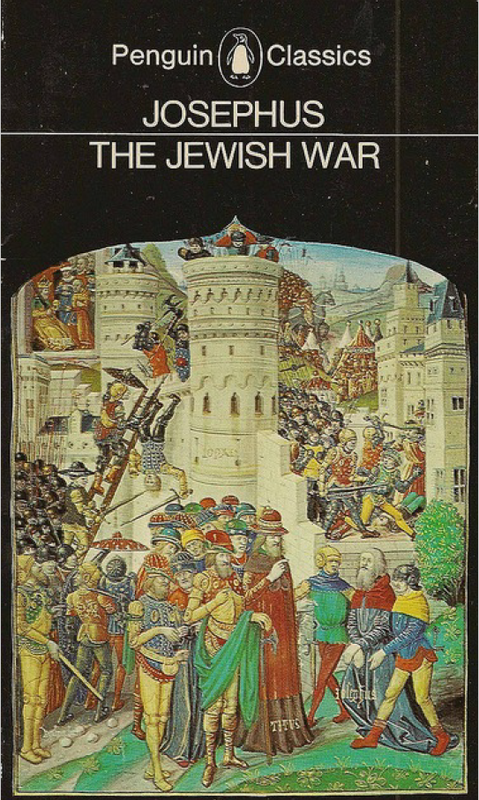 A History of the Jewish War, AD 66-74. Cambridge: Cambridge University Press. Josephus, Flavius. 1959. The Jewish War. Edited by Betty Radice and Robert Baldick. Translated by G. A. Williamson. Penguin Classics. Penguin. Posted on 2018-11-29 20:31:35 GMT+0000 by Neil Godfrey. This entry was posted in Uncategorized and tagged Atwill: Caesar’s Messiah. Bookmark the permalink. Sorry, but I was under the understanding that the whole _War of the Jews_ was originally written in Aramaic for distribution amongst literate Jews at the margins of the empire, under the sponsorship of Titus. It seems to me that they had to be mindful of the influential Jewish community in the competing empire, that of the Parthians. Remember, Judea was effectively on the frontier with the greatest known threat to Rome at the time. The Jews of the Roman empire represented a ‘trans-empiric’ population of some ability and cohesiveness, and capable of drifting back and forth across that porous border. As I was given to understand it, the Aramaic version of how the Jews had nobly resisted the rise of the Roman empire and paid dearly for it, for the Roman empire was ‘irresistible’….the message was that ‘resistance was futile’. The Grecophonic version was later and, along with _The Antiquities_, aimed more at being an apologetic for the ‘stiff-necked’ Jewish people to the Roman elite. Who better do provide that service than the turncoat historian, particularly if he believed it? Josephus seems fairly objective and impartial, as regards Romans versus Jews. After all, 1) as a Jew himself, he first fought against the Romans. 2) But in the end he surrendered to them. And began working with – and many say, for – them. But note that in this progession, Josephus himself finally agreed to live peacefully, under Roman rule.